Ice Scrapers… Gotta have them! The Northeast is getting hit with their first big snow storm today. A perfect opportunity to think about ice scrapers for your next advertising promotion. They’re essential tools to survive the winter. Most people won’t think twice about grabbing a free ice scraper even if it’s not winter. No one wants to get caught in an icy situation without one. Promotional ice scrapers make great ad specialties items. They are inexpensive and practical. Featured in today’s blog is the stronger than ever Heavy Duty Ice Scraper. It is on sale for as low as $.95, but only until December 31, 2008. The modern ribbed grip handle is reversible and it’s large imprint area is always in view. 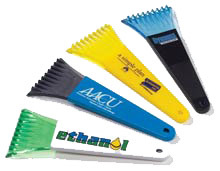 Find the perfect color combination between brightly colored blades and handles to match your corporate identity. Choose the black handles for an eco-friendly product made of recycled material. Order today, before the next snow fall! Rudee December 19, 2008 Comments Off on Ice Scrapers… Gotta have them!